At the Isle of Jura Hotel I was the only guest. There were no grouse shooters. I’d chosen another way to entertain myself…walking. As a safety precaution, I told the hotel manager where I was going and then packed my bag ready for the day. Although it was mid December the weather was warm. It was, though, showery with strong South Westerly winds. I set off from the Three Arch Bridge by the Corran River. 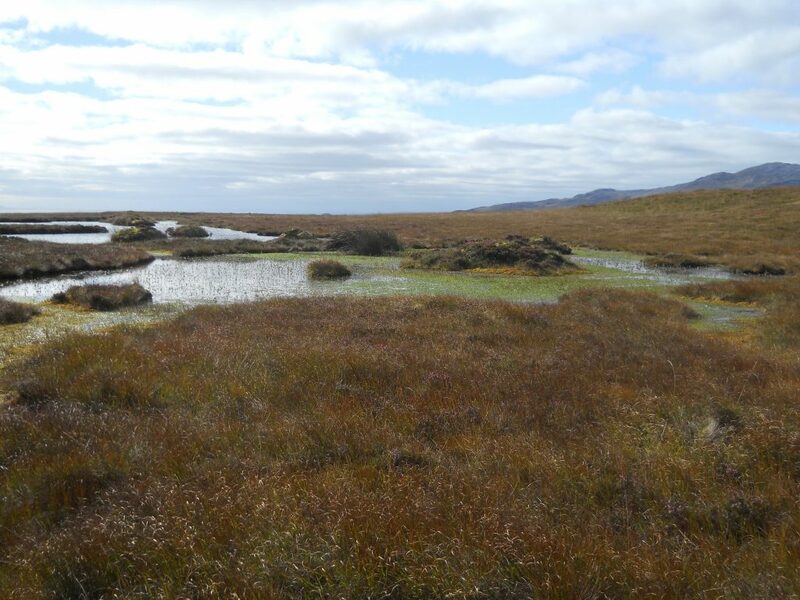 And what an abrupt start it was…hiking through heather, peat and bogs. It was extremely tiring, and that was only the walk to the base of Beinn an Oir. I have to confess that the walk to the summit was a slog and not particularly enjoyable. 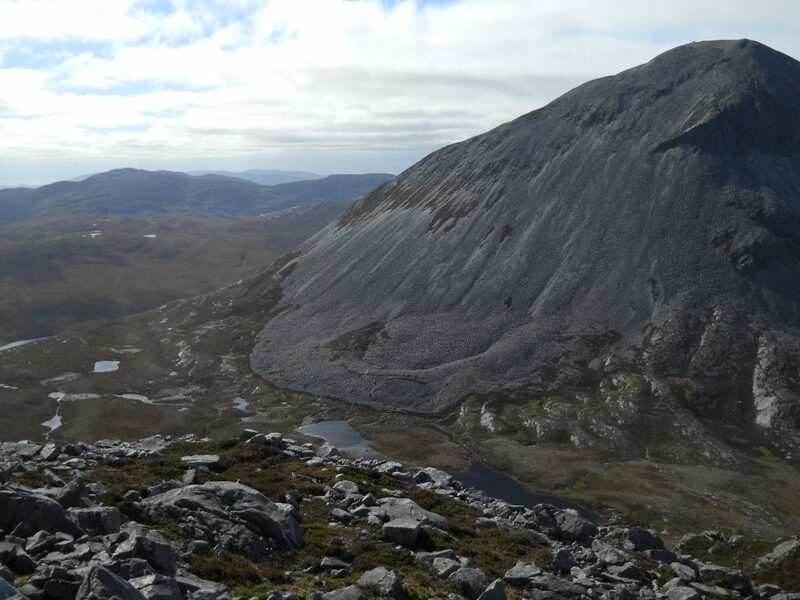 The scree was incessant and the slope was very steep, but towards the saddle between Beinn an Oir and Ben Shiantaidh the walking got easier. The views were stupendous. 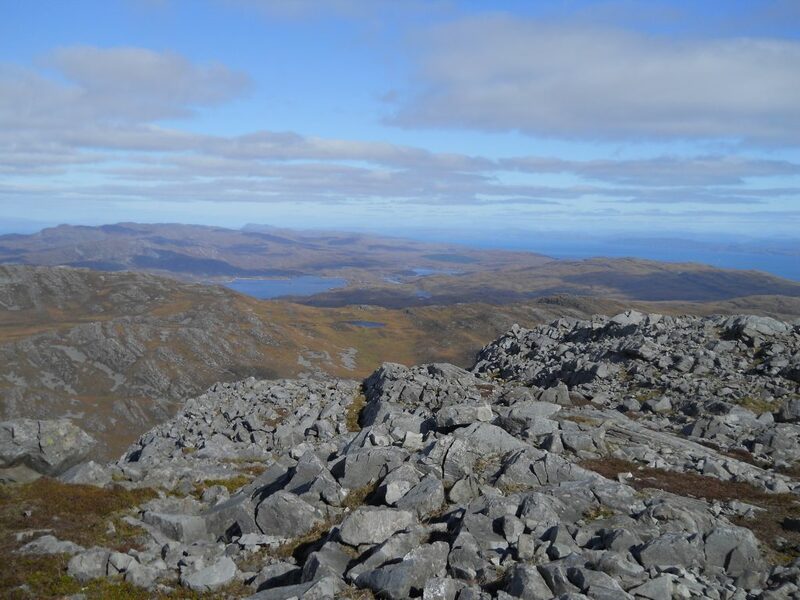 On reaching the summit , the quartzite mountain rocks gave a moon-like feeling and the views to the West to Colonsay; and North to Mull; then to the East the Sound of Jura and Kintyre were incredible, making all the hard work earlier worthwhile. It was then a swift walk back and great to get back to the hotel to enjoy a local Jura malt whisky and to get ready for day two. I went by car as far as the road would allow to Road End. Here I parked by the big gate. There was a sign prohibiting further car travel…the only way forward was now on foot. The weather had turned colder and the wind was coming from the North West. There were rainbows, hail showers, alternating with bright sun. This made great walking conditions. 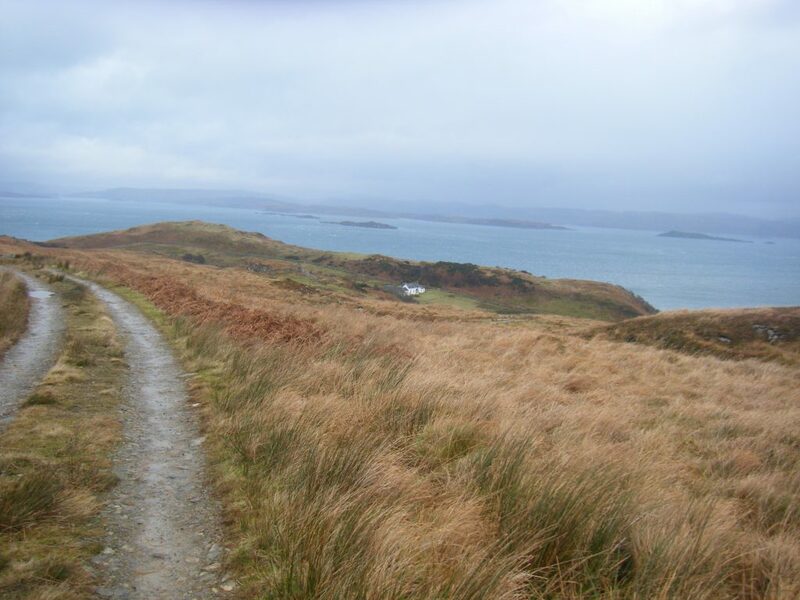 To get to the Northern boundary of Jura and along to Corraig Mhor to look across to Scarba and the whirlpool was approximately 18 miles. There was limited daylight at this time of year so no time could be wasted along the way. The walk was easy but the force eight gale was difficult to walk into. Along the way there were great views across to the Sound. I saw several wild goats, red dear (having escaped the gun of the hunting parties ) and otters along the coast line. It was uplifting to see George Orwell’s House at Barnhill looking so remote yet alive, a single white highland house in a wilderness. Apparently he wrote 1984 there in 1948, hence the title of his book. The sight of his house is a memory that will never fade. So on to the village of Kinuachdrachd where there were a couple of houses with a few animals roaming around and a fine group of cockerels strutting about as though they owned the place. 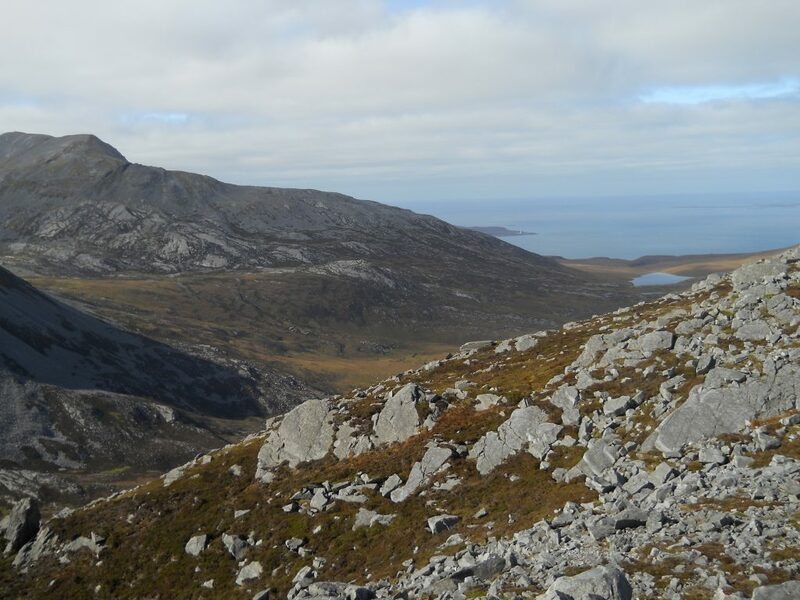 From there the path went on to the northern edge of the island, then west across the heather and dead bracken to a vantage point looking across to Corryvreken. I knew where the whirlpool would be but sadly the tide was wrong and you could only imagine its power…it left a lingering wish to return one day to see it all on a rough, high tide day. It was a long walk back not helped by getting lost in the dark looking at Inverlussa looking for the car at Road End. Returning to the hotel for another fine supper with a few malts was very rewarding after a long, enjoyable and emotional walk on the wild side of Jura, ending two of the best days walking I’ve ever experienced.